Here's to another color revolution! This is akin to Count Dracula asserting his strict adherence to a vegan diet and his principled respect for the integrity of blood banks worldwide. Various quasi-NGOs funded by American taxpayers and funneled through organizations such as the National Endowment for Democracy, Freedom House and the National Democratic Institute, not to mention George Soros’s Open Society Foundations (partly funded by U.S. and other Western governments), have been actively engaged in dozens of “regime-change” operations for a decade and a half. Their work is conducted in disregard of international law and in violation of the sovereignty and integrity of the people whose governments are thus targeted. The overthrow of Slobodan Milosevic in Belgrade (October 2000) provided the blueprint, in strict accordance with Gene Sharp’s manual. Widespread popular discontent was manipulated by the U.S./Soros funded and trained Otpor! network to bring to power a government subservient to Western political and economic interests. The moderately patriotic yet hapless new president, constitutional lawyer Vojislav Kostunica, was used as a battering ram to bring Milosevic down. Once that goal was achieved, Kostunica was promptly marginalized by Prime Minister Zoran Djindjic and his successors – Serbia’s two-term president Boris Tadic in particular – who turned the country into a pliant tool of foreign interests. Wholesale robbery of Serbia’s state and public assets promptly followed the 2000 coup, resulting in the Balkan country’s comprehensive de-industrialization. Official Belgrade was forced to accept Kosovo’s de facto “independence” in the name of the elusive goal of joining the European Union. 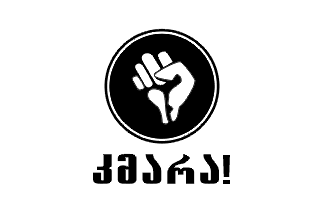 Georgia’s 2003 “Rose Revolution” was carried out by the Kmara (“Enough”) network, a carbon copy of Serbia’s “Otpor,” including the clenched fist logo. Its activists were trained and advised by the U.S.-affiliated Liberty Institute and funded by the Open Society Institute. It brought to power Mikhel Saakashvili, a corrupt “pro-Western” politician currently wanted by Georgia’s government on multiple criminal charges. The coup was largely financed by Soros’s network, which spent $42 million in the three months before the coup preparing the overthrow of the government of Eduard Shevardnadze. The most important geopolitical result was Georgia’s NATO candidacy, supported by Washington, which is currently stalled but which has the potential to be as perniciously destabilizing as the crisis in Ukraine. Speaking in Tblisi in June 2005, Soros said: “I am very pleased and proud of the work of the Foundation in preparing Georgian society for what became a Rose Revolution, but the role of the Foundation and me personally has been greatly exaggerated.” The new government, as it happens, included Alexander Lomaia, former Secretary of the Georgian Security Council and minister of education and science, who at the time of the coup was Executive Director of the Open Society Georgia Foundation. David Darchiashvili, ex-chairman of the Committee for European Integration in the Georgian parliament, was also an executive director of the Foundation. As former Georgian foreign minister Salomé Zourabichvili wrote in 2008, “all the NGO’s which gravitate around the Soros Foundation undeniably carried the revolution… [A]fterwards, the Soros Foundation and the NGOs were integrated into power.” Interestingly, the U.S. Ambassador in Georgia at the time of the 2003 regime-change operation, Richard Miles, was the Ambassador in Belgrade at the time of Milosevic’s downfall three years earlier. The march of history continued with the 2004 “Orange Revolution” in Ukraine – that grand rehearsal for the Maidan coup a decade later – and the 2005 “Cedar Revolution” in Lebanon, which was given its name by then-U.S. Under Secretary of State for Global Affairs Paula J. Dobriansky. Also in 2005 the “Tulip Revolution” in Kyrgyzstan had as its chief foreign advisor Givi Targamadze, an official of Georgia’s aforementioned Liberty Institute, who at the time chaired Saakashvili’s parliamentary committee on defense and security. In 2012 President Obama authorized U.S. government agencies to support violent regime change in Syria. By early 2013 the Administration was helping the “moderate” rebels – i.e. jihadists with no overt links to al-Qaeda – to the tune of $250 million, and that figure has been at least doubled since. The result has been disastrous for the Syrian people (Christians in particular), and hugely detrimental to U.S. security interests in the region. The insurgency against Bashar al-Assad has directly contributed to the rise of ISIS, with no end to the latest war in sight. Last month Venezuelan President Nicolas Maduro gave a televised speech in which he alleged systematic U.S. involvement in destabilization attempts against his government. The U.S. Department of State called his claims “baseless” and “false.” “The United States does not support political transitions by non-constitutional means,” read the statement from Department spokesperson, Jen Psaki. Indeed. One of the leaders of the failed anti-Chavez coup d’etat in 2002, Rear Admiral Carlos Molina, has stated that he was acting with US support. Ditto the CIA-supported regime-change operation in Nicaragua in 2009. As for the Maidan Revolution, crowned by “political transition by non-constitutional means” par excellence, Victoria Nuland readily admitted that its preparation cost the U.S. taxpayers some $5 billion over the preceding decade. The result is the most dangerous geopolitical crisis of the post-Cold War era, systematically engineered and conducted by the regime-changing exceptionalists in Washington D.C. who believe that they are exempt from historical forces and legal restraints that apply to merely mortal countries. Former U.S. Ambassador in Moscow Michael McFaul boasted to The New York Times a week after taking duty in January 2012 that he would make his “pro-democracy” mark in Moscow “in a very, very aggressive way.” Some months earlier, McFaul declared that “even while working closely with Putin on matters of mutual interest, Western leaders must recommit to the objective of creating the conditions for a democratic leader to emerge in the long term.” This was a regime-change agenda expressed with brutal bluntness: we need to “de-Putinize” Russia, he declared. It would be interesting to see the U.S. reaction if a similar statement (“We need to to de-Obamanize America!”) were to be made by an incoming Russian ambassador in Washington. In Russia the regime-change program did not work, however. First and foremost, there was no popular support: hundreds of “activists” demonstrating against Putin in 2012 could be turned into “thousands” in Western post-election media reports, but that was still far below the tens, let alone hundreds, of thousands needed to kick-start a regime-change op. Infuriatingly for the planners, Russia simultaneously enacted a law regulating foreign “NGO” activities which was patterned directly on the American Foreign Agents Registration Act (FARA), which regulates activities of the agents of foreign governments in the United States. Enacted in the 1930’s to require disclosure of Americans working on behalf of Nazi Germany, and used to control Soviet agents thereafter, FARA requires full public disclosure of those same activities that the U.S. government had tried to fund in Russia. The Federal Election Campaign Act flatly prohibits foreign involvement in American elections – yet it was touted as legitimate when conducted in Russia by Washington’s protégés under the guise of promoting democracy. The regime-change mania will go on and on. It is inseparable from the psychotic belief in one’s indispensability and exceptionalism. It is a form of self-defeating grandomania that can only stop with America’s long-overdue abandonment of the global hegemony experiment. And yes, John Kerry is a liar.